and I contoured my face with the Guerlain Terracota bronzer, it looks super natural and have nice glow to it! the new bows are so cute! i love the new bows, i will definitley be purchasing them! and wow love the new bows! aww, new hime? gonna get it somehow! 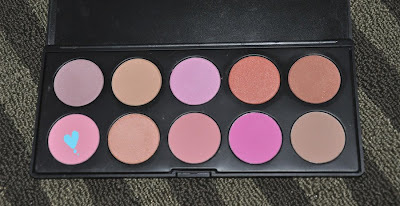 btw, cbox me and let me know how you're enjoying your jill stuart eye palettes- I've been DYING foreverrrr to get my hands on them! EKI!! you always look so flawless~im so jealous!! hehehehe i really like your blush as well! omg the bows are so cute eki!! Very Cute Bows you've made there!! Eki! I want to see YOU on the cover of VoCE instead of Risa Hirako hugging a furry oversized bunny!! Love the DSK! You are my fave kawaii Japanese lady! very pretty bows :) and the bronzer looks really nice on you. The new bows are so kawaii!!! You keep the new designs and styles coming ^_^ Never stop okay??! You always look amazing Eki! Your bows are pretty like you, too! The amber necklace looks so cute on you! love the bronzer on you. very cute look! the bronzer looks pretty! 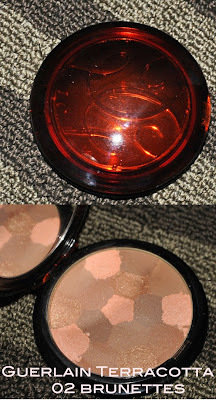 The Guerlain Bronzing Powder looks so pretty. Are you wearing it in the pictures? Looks so natural. I definitely have to check this out next time, since I haven't found a bronzer that works for my very fair skintone, yet. ;) Thanks for sharing! ooOOo such pretty bows Eki! I got the package!!! I love the headbands. And thanks for the sneak peak into your new kawaii bow line. They are lovely, I like the clips you used, and I think everyone would love them. I must take pictures and show you your creations! I wear your mini clips all the time!!! I love ribbons so I really like them! very pretty ! i'm waiting for my jewelry from steph ;). i love the bows and you look fag girl. 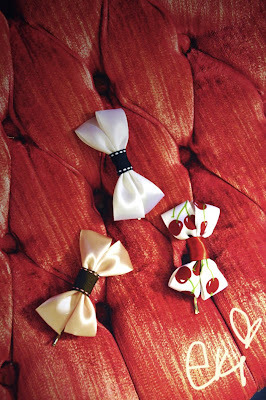 very pretty FOTD :) the new bows look so cute - I love the cherries! I'm going to have to place an order when I get paid again...if I can stop myself from buying too many beads =P can't wait to see the new collection!